The year 1837 to 1839 saw the Hawaiian Mission work undergoing a great Reinforcement Period. The Rev. Hiram Bingham, head of the Hawaiian Mission, had been petitioned by the common Hawaiian folk of Honolulu to establish a second church or mission in Honolulu (Kawaiahaʻo being the first). Governor Kekūanāoʻa suggested, "it should be in the village" (Honolulu); specifically, in the district of Kaumakapili where some 13,000 people lived. The common Hawaiians felt the need for a place of worship where they could be treated with "equality" and was located close to where they lived. They requested that Rev. Lowell Smith be their pastor. The 1837 annual ʻAha Pae'āina granted their request. The Benevolent Chief, Abner Pākī and wife, Kōnia, granted the lot on the corner of Smith and Beretania Streets for this mission - the area then known as Kaumakapili. Pākī and Kōnia were parents of Princess Bernice Pauahi Bishop, founder of the Kamehameha School. On April 1, 1838, the first Sabbath of the month, the Rev. Hiram Bingham assisted the Rev. Lowell Smith in organizing the church. Twenty-two people were received via letter of transfer from Kawaiahaʻo Church, two received from ʻEwa; one from Kauaʻi; 49 on profession of faith. This was the commencement of Kaumakapili Church. The first Church building was constructed of adobe with a thatched roof and was large enough to accommodate 2,500 people. 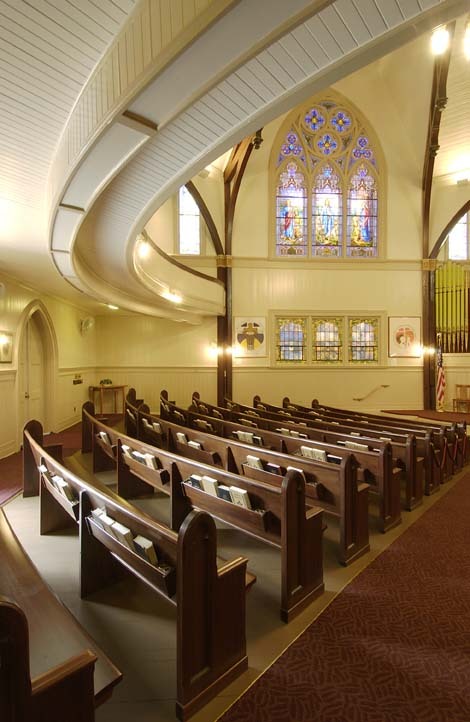 On August 29, 1839 the church building was dedicated. In 1865, as King Kamehameha V was nearing death, he asked High Chiefess Bernice Pauahi to be his successor, but she refused. According to law, an election was held and Kaumakapili was used as Honolulu's town hall during this and many future political crises. In 1881 the adobe building was torn down to make way for a new brick edifice. The cornerstone was laid on September 2, 1881 by the newly recognized Princess Liliʻuokalani, as that day was her birthday. Dr. C.M. Hyde, designer and member of the building committee, intended it to be in "cruciform" style with only one floor. King Kalākaua however, taking great interest in the church, wanted a more imposing structure with two steeples. His argument was, "...that a man has two arms, two eyes, two ears, two legs, therefore, a church ought to have two steeples." The king, of course, won out. Seven years and $65,000 later the new building was completed with a high basement, a flight of outside stairs to an auditorium measuring 50 feet by 100 feet. The building was indeed an imposing landmark, first of its kind, and visible to arriving vessels and land travelers. 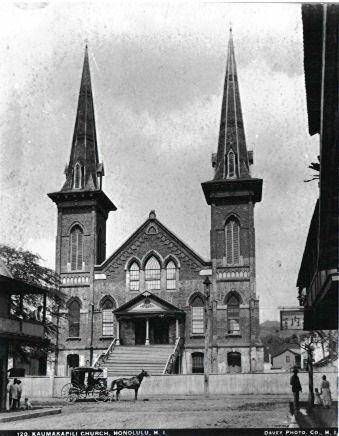 It was dedicated on Sunday, June 10, 1888. This church played an ironic role during Kalākaua's reign. The Honolulu citizens held a meeting in this building protesting Kalākaua's capriciousness and appointment of an Italian-American adventurer named Moreno as his Minister of Foreign Affairs and the appointment of a new cabinet, whose "grotesque unfitness" caused the people to be up in arms. The result was the dismissal of Moreno four day's after his appointment. This church, one might say, was a forerunner to our present Free Store. It's basement was used to storage of valuable jewels and fabrics for people who lived in Chinatown. In January 20, 1900, disaster struck, perhaps because they had no Hale Hoola Hou Clinic. The presence of bubonic plague in the Chinatown area caused the health authorities to take drastic measures by burning sections of Chinatown near the church. Sparks fell on the wooden steeples and fire engulfed the entire building leaving only the brick walls stand. Honolulu's landscape was changing, so the old site at Smith and Beretania Streets was sold and a new one bought at the corner of King and the then Simerson (now Pālama) Streets in Pālama. The Rev. Henry K. Poepoe began his ministry at Kaumakapili in 1903 and served as co-paster until 1950. Together with the Rev. William Nehemiah Lono, then Kahu of the church, both kahu moved services to a temporary small wooden chapel on Austin Lane, behind the old Pālama Fire Station. Here, for the next 10 years, the church developed its ministry with a strong emphasis on Sunday School ministering; particularly to the girls from the old Reform School that was situated on the site of the present Kaʻiulani Elementary School. During these years and the years to follow Rev. Poepoe fostered the idea of enlisting young Hawaiian men into the Christian ministry. Among those he touched were Edward Kahale, Samuel M. Saffery, Sr., Samuel Keala, Edward Woodward, Robert Lewers, Roger Kanealii, Edward Kapoo and several others. The Rev. Samuel Keala eventually succeeded Rev. Poepoe following his passing in 1950. This time of Kaumakapili's history enjoyed a very active Sunday School under several outstanding superintendents - among whom were Augustus Smith, only son of founders Rev. Lowell and Abigail Smith, and one of their daughters, Mrs. Benjamin F. Dilllingham. On May 7, 1910, Master Harold R. Erdman, great grandson of the Rev. Lowell Smith, broke ground for the third church building. Under the direction of its building committee, S.N. Kanakanui, S.K. Kamaiopili, S.H. Oni, Charles Mahoe and W.H. Nahalau, the building was completed. 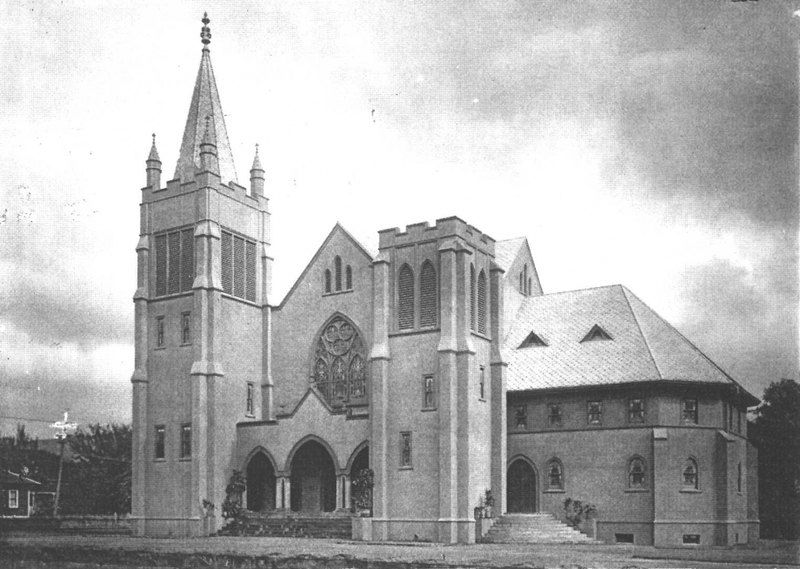 It was dedicated on June 25, 1911, the same day in which the 89th ʻAha Pae'āina was hosted by the church. 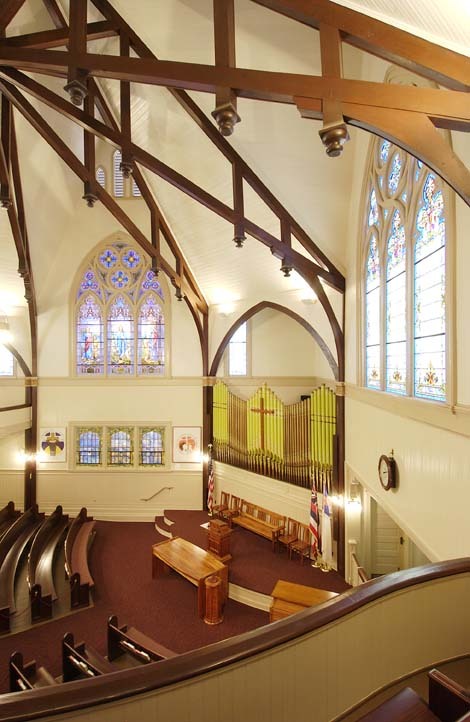 The present building hold many loving memories for many of our makuas and young adults of today - the stained glass windows, the pews, the pipe organ, all the koa pulpits, etc. 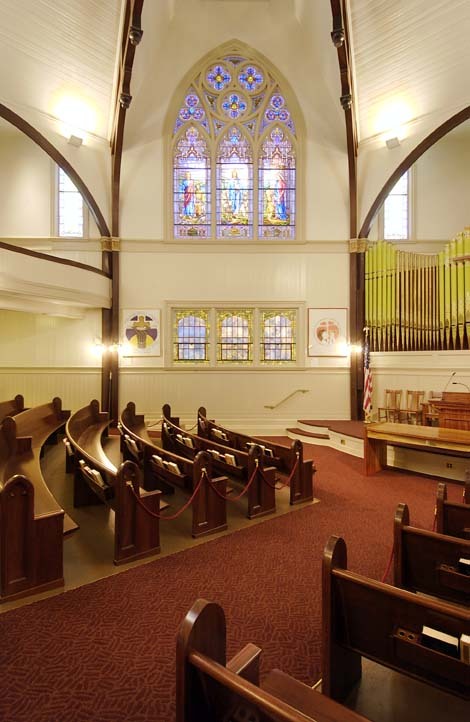 On the day of dedication of the original two stained glass windows, the great grandson of Rev. Lowell Smith, Lowell S. Dillingham, was baptized on September 13, 1912. In the late twenties and early fifties, Kaumakapili was known as the "Queen of the Hawaiian Churches" for she had begun missions and sister churches' relationships as her witness to the community. The Maʻemaʻe Chapel was started by deacon Charles Mahoe and his wife, Haleaka, on Wylie Street in Nuʻuanu. It was primarily a Sunday School for the families who lived in the area and met in the afternoons. The ʻAuwaiolimu-Pauoa Chapel has since been demolished but the property remains as Pauoa Hawaiian Cemetery. This, too, was once a flourishing Sunday School ministering to the families of that area. Kaumakapili Church's original Parish Hall (where Hale Kamika now stands) was built some 15 years after the main sanctuary. It was the center of the church's social activities. The kitchen was the key to Kaumakapili's popularity. From 1911 until 1969, very little written history was kept of the church. The vague recollection of this period remains primarily with those mākua who remain today.